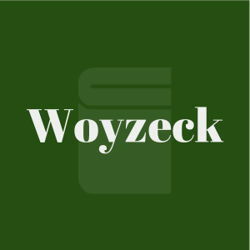 Loosely based on the real figure of Johann Christian Woyzeck, Georg Buchner’s Woyzeck is a naturalist indictment of the dehumanizing effects of the military and science on unsuspecting victims. The titular character is a soldier unwillingly subjected to a doctor’s experiment just so he can have enough money to support his common-law wife (Marie) and their illegitimate child. While his body deteriorates, Woyzeck’s mind and soul are broken by his captain’s psychological torture, culminating in the murder of Marie and his own subsequent suicide. Although left incomplete at Buchner’s death - and with no definitive text or order of scenes - Woyzeck is one of the most influential and performed plays in German theatre; its themes of poverty, isolation, and morality still resonate with audiences worldwide.